The National Sports Center for the Disabled offers professional opportunities to individuals looking for dynamic and rewarding experiences. 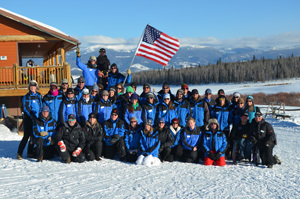 Positions are available at the Mountain location in Winter Park, Colorado and the Metro location in Denver, Colorado. Under the supervision of the Volunteer Services Director, the Volunteer Services Coordinator manages the administrative operation of the volunteer office, including data entry, volunteer applicant processing, volunteer scheduling and maintaining data integrity in the volunteer database. The Volunteer Services Coordinator will also take a lead role in the efforts to research, create, schedule, and attend presentations for volunteer recruitment and awareness. This position develops and maintains new and long term relationships with the goal of increasing the NSCD volunteer base and aligning volunteers with compatible NSCD volunteer opportunities. The primary objective of this position is to provide comprehensive support for all volunteer services activities. To apply, complete the NSCD Application and email to [email protected] along with a resume and cover letter. Include “Volunteer Services Coordinator” in the subject line of the email. Under the supervisor of the Program Supervisor, the Mountain Instructor teaches adaptive sports and therapeutic recreation lessons to individuals with disabilities. This position includes instruction in activities for individuals, group lessons and custom programming. Instructors may determine usage of adaptive equipment and may also teach instructor and volunteer training clinics. Program locations determined by activity schedule. To apply, complete the NSCD Application and email to [email protected] along with a resume and cover letter. Include “Program Instructor” in the subject line of the email. Teaches therapeutic horseback riding activities to individuals with disabilities. Assesses, plans, implements, evaluates and leads horse riding activities for individuals, groups and camps. Completes the daily duties of horse care, feeding, grooming, volunteer coordination and venue upkeep. To apply, complete the NSCD Application and email to [email protected] along with a resume and cover letter. Include “Therapeutic Horseback Riding Instructor” in the subject line of the email. The Program Instructor provides direct client services instruction. In this position, you will lead participant programming, group and individual, for metro sports and activities. Instructors train and guide volunteers assigned to the programs, and may determine the usage of adaptive equipment. The Program Instructor also coordinates programming with the supervisor. Supervises operations associated with NSCD programs including the planning, coordination, implementation and evaluation phases. Coordinates custom groups, weekly programs and camps; mentors staff and volunteers; and supervises NSCD instructors, interns and volunteers. Provides direct client services instruction. To apply, complete the NSCD Application and email to [email protected] along with a resume and cover letter. Include “Program Supervisor” in the subject line of the email.